We present a discriminative key pose-based approach for moves recognition and segmentation of training sequences for high performance sports. Compared with daily human gestures, moves in high performance sports are faster and have low inter-class variability, which produce noisy features and ambiguity. 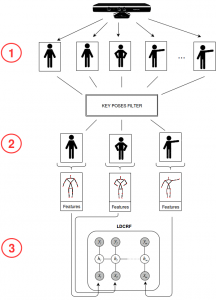 Our approach combines a robust filtering strategy to select frames composed of discriminative poses (key poses) and the discriminative Latent-Dynamic Conditional Random Fields model to predict a label for each frame from the training sequence. 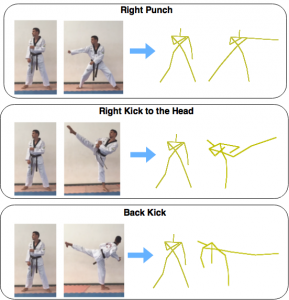 We evaluate our approach on unsegmented sequences of Taekwondo training. Experimental results indicate that as far as processing time and accuracy are concerned our methodology presents the best performance when compared against Decision Forests method. Our average recognition rate was equal to 74.72% while Decision Forests achieves 58.29%. The experiments also show that our approach was able to recognize and segment high speed moves like roundhouse kicks, which can reach peak linear speeds up to 26 m/s. The dataset was created by recor ding high performance athletes training sessions in a professional training center. We create the dataset at the sports training center with the guidance of its Taekwondo head coach. We selected ten athletes of different genders, ages and heights to perform the seven different moves. The athletes ages ranged from 14- to 26-years old and their height from 160 cm to 176 cm.